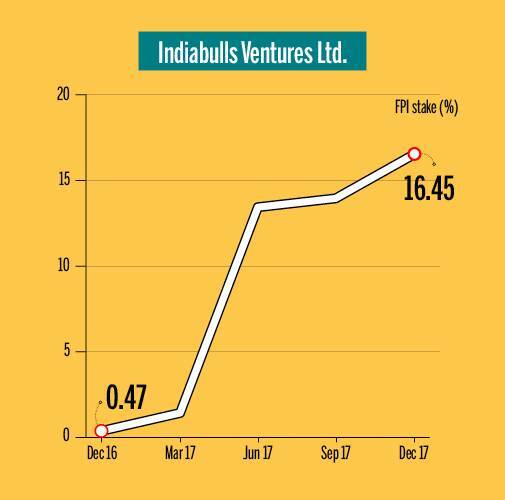 Indiabulls Ventures: Its primary businesses include Broking and Related activities and Lease Rental activities. The FPI stake in the company went up from 0.47 per cent in December 2016 quarter to 16.45 per cent in December 2017 quarter. In Q3FY18, the consolidated net sales of the company grew by 156.9 per cent. Helped by increase in other income and decrease in depreciation costs, its net profit grew by 563 per cent. The stock outperformed the broader market by nearly 40 times and delivered point to point return of 1,132 per cent between December 30, 2016 and February 16, 2018. BSE500 index delivered 32.4 per cent return in the same time period. 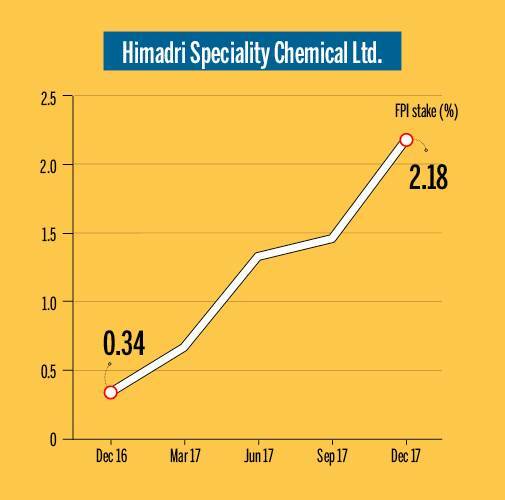 Himadri Speciality Chemical: A coal tar pitch manufacturer that caters to 65 per cent of the Indian Aluminium and graphite industry's requirement of coal tar pitch. The FPI stake in the company 0.34 per cent in December 2016 quarter rose to 2.18 per cent in December 2017 quarter. In Q3FY18, the company's operating profit grew nearly 100 per cent to Rs 62.68 crore. It reported 248.8 per cent growth in net profit helped by substantial reduction in interest costs that fell by over 50 per cent. The stock delivered 393.8 per cent returns between 31 December 2016 and 15 February 2018 and outperformed the market by over 12 times. BSE500 delivered 32.4 per cent returns in the same period. 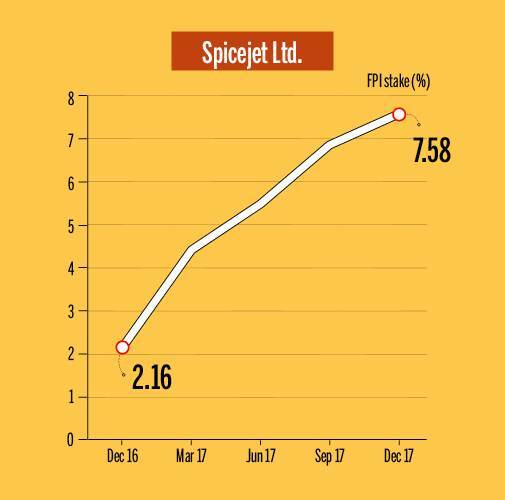 Spicejet: A low cost carrier engaged in the business of scheduled air transport services. The FPI stake in the company went up from 2.16 per cent in December 2016 to 7.58 per cent in December 2017 quarter. In Q3FY18, the operating profit and net profit grew by 63.2 per cent and 32.5 per cent respectively. The net profit margins went up from 11 per cent in Q3FY17 to 11.5 per cent in Q3FY18. The stock delivered point to point returns of 147.2 per cent and outperformed the market by over 4.5 times. BSE500 index delivered 32.4 per cent between 31 December 2016 and 15 February 2018. Minda Industries: The company is a supplier of proprietary automotive solutions to OEMs. Headquartered in Manesar, Gurgaon, the Company has 12 direct subsidiaries and 7 step-down subsidiaries, 3 joint venture companies and 5 associate entities. Foreign investors have increased their stake in the company from 3.46 per cent in December 2016 quarter to 8.21 per cent in December 2017 quarter. Company's top line and bottom line grew by 15.8 per cent and 21.88 per cent respectively in Q3FY18. The stock gained over 266 per cent between 31 December 2016 and 15 February 2018 and outperformed the market by over 8 times. BSE500 index delivered 32.4 per cent in the same period. 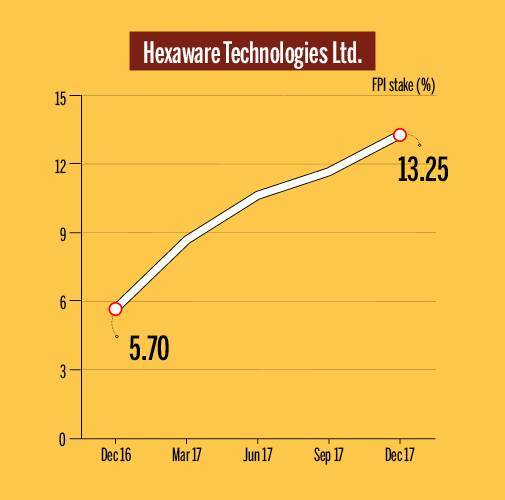 Hexaware Technologies: The company is engaged in IT, BPO and consulting services and its business domains includes banking, financial services, capital markets, healthcare, insurance, manufacturing, retail, education, telecom, travel, transportation and logistics. FPIs have increased their stake from 5.7 per cent in December 2016 quarter to 13.25 per cent in December 2017 quarter. In December 2017 quarter, the operating profit declined by 2.6 per cent due to increase in total expenditure. 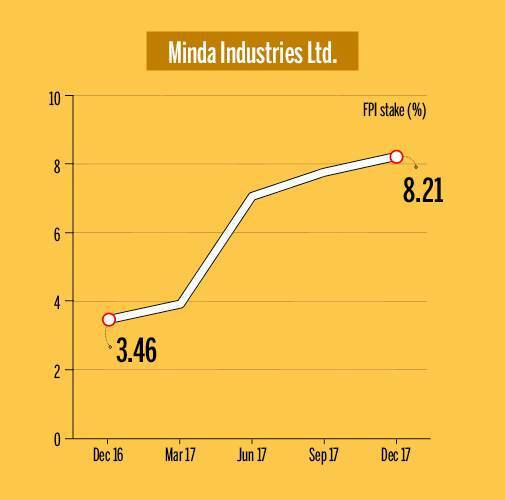 Company's net profit margins declined to 12.04 per cent in December 2018 quarter compared to 13.07 per cent in December 2017 quarter. The stock outperformed the market by 1.9 times between 31 December 2016 and 15 February 2018. It delivered point to point return of 60.73 per cent compared to BSE500 index that delivered 32.42 per cent.